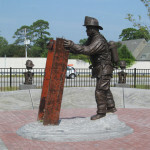 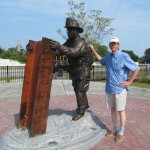 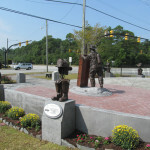 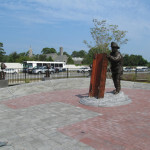 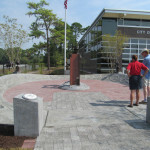 Completed in 2013, the Wilmington Firefighter Memorial is located in Wilmington NC. 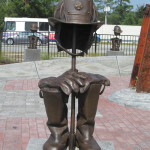 A steel beam is at the center of a fire helmet-shaped memorial, held upright by a statue of a firefighter in full gear and ringed by seven empty helmets, pairs of gloves and pairs of boots. 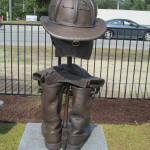 The seven sets of firefighter gear are to honor the men who have died in the line of duty since the Wilmington Fire Department was formed in the mid-1800s, while the piece of steel honors the 343 firefighters who died in the Sept. 11, 2001, terrorist attacks on the World Trade Center.